For a few years now, I have been using washcloths in our kitchen to wipe up spills, clean faces, wash dishes, and clean the counters every evening. We go through quite a few each day and I have noticed that it has helped us to keep our use of paper towels down to a minimum (we haven't eliminated them completely). Typically, I throw dirty washcloths into the laundry room throughout the day so that they can go into the next load of wash that I do. Despite my positive experience with reusable cloths in the kitchen, I have been resistant to using cloth napkins. I think that it has something to do with thinking deep down that they are for fancy meals and shouldn't be used everyday lest they be ruined. Isn't that silly? We have begun to use a set of chocolate brown hemstitch napkins that I bought years ago for Thanksgiving dinner fairly regularly and despite being rather messy eaters, we have not ruined a napkin yet. Feeling brave, I recently purchased five (I'd like to buy more as the budget allows... I haven't decided if it is better to have 8 or 12) red and white gingham napkins with dear little red picot trim. We broke them in last night with a dinner of ravioli, meatballs, and lots of spaghetti sauce. I simply tossed them into the washer before bath-time and voila! They were ready for breakfast with nary a mark on them! I am not very fussy about how they look, so I simply smooth them a bit as I fold them and don't worry about the creases in the least! In fact, I think they look better if they are a little rumpled. 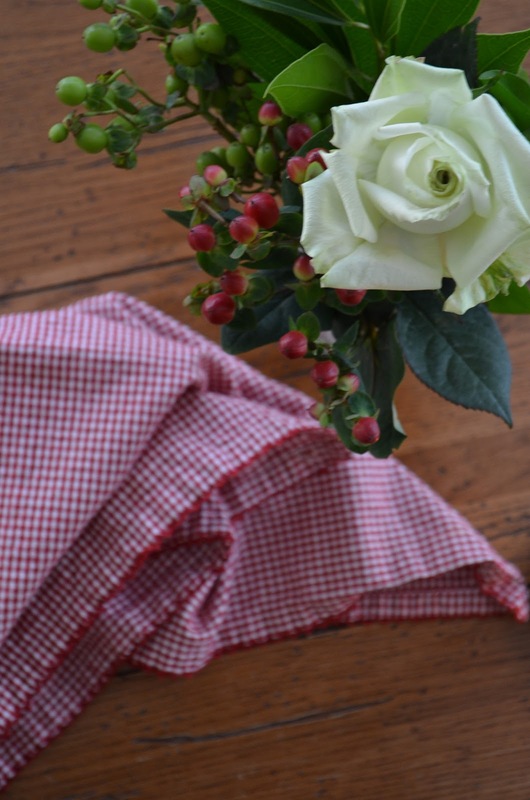 Do you use cloth napkins? How do you care for them? How many do you find you need for your family? We've been using cloth napkins for about ten years now, with four children! We have a set of eight red ones that we use when eating anything with tomato sauce, and a set of a dozen colourful flowered ones for everything else. I've found that patterns last longer than solids, as stains aren't as visible. We use the same napkin all day (unless it gets really messy :), and after dinner is cleared away we leave them to soak in cold water overnight. In the morning they go into whatever laundry load I'm washing first, then hung to dry. We have been using cloth napkins for years. As both my husband and I work full time we use one napkin all day, which amount to 2 meals. I gather them up at the end of the week and wash them with wither my sheets or towels. Even with sitting for 5 days or so they come out clean and stain free. I have some blue patterned ones that we use and that wash up really well! they are wonderful! We've been using cloth for several years, though we do have paper for backup, because I don't wash them as promptly as you. I save up a week's worth of napkins and wash them in one load together with the dish towels and tablecloths and microfiber cleaning cloths (our substitute for paper towels) -- I have a rack in the basement where I let them dry during the week. I agree, bold colors and patterns are better at hiding the stains. I have several sets for everyday and some that are for company. Thanks for this discussion -- it's interesting to see what other people do. We have three different sets of napkins that don't match at all. We use them until they run out, and then supplement with cloth if necessary. I only wash them once a week. I suppose I should make or buy a few more! I remember thinking about using them in the beginning, and thinking that I couldn't start using them until I had enough to get through the whole week. But then I reasoned that I would still be saving money/reducing waste even if we used just the few we had each week before using the paper ones. I'm glad I was able to get over that mental hurdle. I had a hard time with the "cloth is for fancy occasions" as well until dd saw a craft book with rip and tear napkins. She literally tore squares of fabric from my stash into napkin size pieces, not hemming or anything. They wash up just fine, and we save the actual hemmed napkins for those fancy days :)Drives grandma nuts but the un-hemmed napkins kid all six of us tidy. You can usually get them pretty inexpensively. You can either get all one color or (like I do)get several different colors. Oh, I love all of these thoughts! Thank you for commenting, everyone! It's just my husband and I, no kids, and we have been using cloth napkins for years. I initially bought 16 cream cotton ones (four sets of four on special). I've also made a few pairs out of patterned cotton fabric and been given some as well. These are our everyday ones and I wash them once a week, with tea towels, dish clothes etc on a hot wash, sometimes a hot soak wash. I used to iron them damp and hang on a rack to dry, but I don't iron them anymore. I just fold and smooth. Having enough that you don't have to wash too often I think is key to be happy using them. I too use dark and patterned ones for food like tomato pasta sauces! I haven't joined the ranks yet, but after reading this post i am interested. In the past I've used some on a trial basis but noticed that every time I use a cloth napkin, it usually is not absorbent, but rather smears things around. Are there any absorbent ones on the market? Any thoughts? I have been wanting to use cloth napkins ever since I first read this post, and I am STILL scared because of the kids. But...I'm mustering up the courage. I have a coupon to Pier 1 and they have a napkin sale going on, so I am going to take the plunge... I reread this post for confidence, and thought I should tell you, haha! Thanks for the confidence that it can be done with kids. Mine have taken to ripping their napkins anyway, so we are going through WAY too many paper napkins. Thanks for being so inspiring!